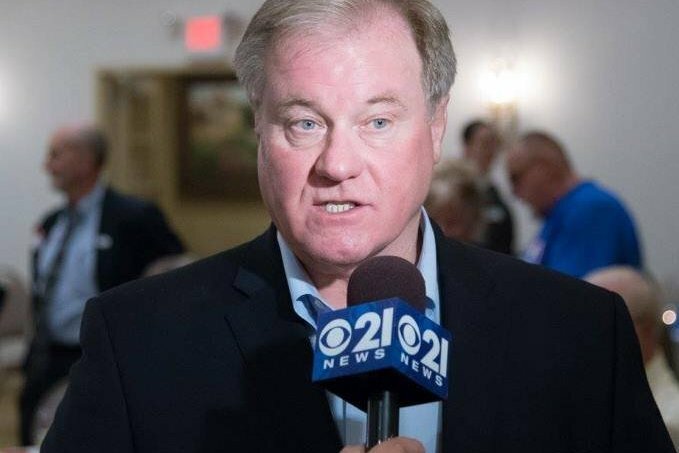 Pennsylvania state Sen. Scott Wagner, the Republican who Vice President Mike Pence came to Philly to endorse last June, joked Friday he was getting election help from another political force – the Russian government. The Huffington Post reported the comment after the Pennsylvania Democratic Party obtained a recording of Wagner speaking to a crowd in Wyomissing, Berks County. "By the way, the Russians are going to help me with Tom Wolf," he said. "If I have to use Paul Manafort, I will." The comments were met with applause and laughter, suggesting they were made as a joke. Hear it for yourself in the video below. Manafort, who acted as President Donald Trump's campaign manager during the summer of 2016, is currently under indictment for his work on behalf of the pro-Russian government of Ukrainian President Viktor Yanukovych. Wagner's comment comes amid Robert Mueller's investigation of the 2016 U.S. Presidential election and the possibility there was Russian interference to aid Trump. "Scott was obviously joking when he made those comments. He thinks that Russia's interference in the 2016 Election was real and he pledges to work with the federal government to secure fair elections in Pennsylvania as governor." With Russia or not, Wagner is indeed lagging behind in the polls. A June report from the York Daily Record shows Wolf leading Wagner at 49 percent to 36 percent, with 14 percent undecided. This is similar to Sen. Bob Casey's lead against Lou Barletta, another Pennsylvania candidate that brought Pence to Philly for endorsement. In one poll, Casey reportedly is leading Barletta at 47 percent to 32 percent, with 20 percent undecided.